ThinkGeek originally created the iCade as an April Fool's joke a few years back. It was basically a small arcade cabinet for the iPad. It sounds silly, but the demand for the product was so strong that ThinkGeek went ahead and made it available to consumers for roughly $100. 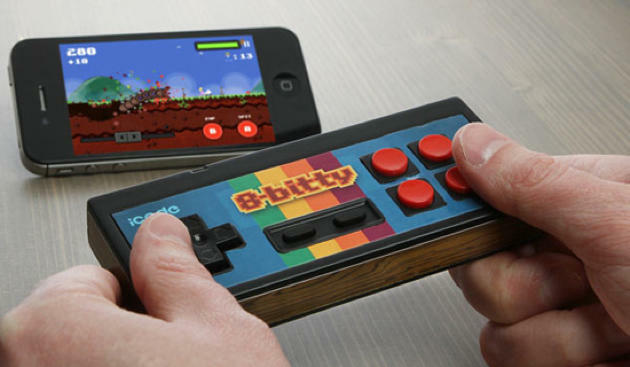 Now, without an April Fool's joke facade, ThinkGeek has announced the iCADE 8-Bitty. The 8-Bitty, as you see above, is an NES style controller (with a few extra buttons) that wirelessly pairs with iOS devices to provide an old school tactile feel to a growing slew of compatible games. The controller, unfortunately, is just in the announcement phase as of right now. ThinkGeek will be selling it for $24.99 some time later this year, and you can actually sign up to be notified when it launches on the product's landing page. The device will require two AAA batteries to operate. It will be compatible with the iPhone, iPod Touch and iPad. You can't see it in the image above, but the 8-Bitty also rocks shoulder buttons in addition to those pictured on the face of the controller. There's a full list of compatible software on the product's page, but ThinkGeek announced that development for this device is completely open-ended. Developers can add app support to the device, according to ThinkGeek, without consent from any company and they can do so even on the Android platform. Sure, the device itself may be a little gimmicky in design; but, we have to admit that the thing we hate about gaming on touchscreen devices is the absence of tactile controls. Buttons make gaming great, so these buttons should do the trick if you're looking to game constantly on your iOS device. Will you be watching ThinkGeek once this thing releases, or do you find touchscreen gaming to be fine enough to meet your needs?